Aswan was the departure point for the great caravan routes to the south and the area where the powerful noblemen of the Old Kingdom in ancient Egypt kept the border with Egyptian Nubia. 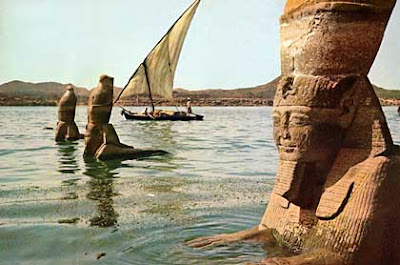 Unlike Luxor which grew into an important metropolis, Aswan retained its trading- post aura. Situated partly on the plain and partly on a hill, it commands a view of exceptional beauty where the Nile divides into several arms separated by islands of granite. In the 1951s this was where the Aga Khan wintered, along with the rest of Europe’s notables who found it the world’s most desirable escape from winter. The granite quarries at Aswan, the source of the finest quality granite for Egyptian tombs and temples building, were exploited from the early dynasties through to Roman times. A huge unfinished obelisk in the northern quarry, on which the undercutting was never completed, would, if raised, have been taller than Hatshepsut’s obelisk at Karnak; 95 feet against 92. The rock tombs at Aswan date for the most part from the close of the Old Kingdom and from the Middle Kingdom. The tomb of Harkhuf, the first explorer, who brought back a dwarf for his pharaoh, is situated here. One of the best-preserved tombs is that of prince Siren- powet (Middle Kingdom in ancient Egypt) which contains interesting family scenes. In antiquity the whole area surrounding and including the island of Elephantine was known as Yebu, or Elephant Land. On the southern section of the island are the ruins of the ancient town. There is also an ancient nilometer and the foundations of a temple constructed of stones brought from earlier temples. 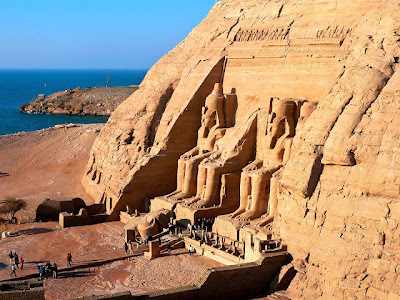 The Kalabsha Temple, the largest detached structure in Nubia, dating from the time of the late Ptolemies and the Emperor Augustus, has been dismantled and reconstructed on a new site in Aswan to save it from flooding by the Nile due to the Aswan Dam scheme. Official inauguration of the reconstructed temple took place in 1976.